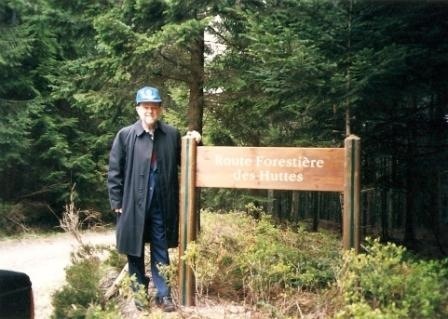 Early evening April 23, 1998, four 'Dutch Texans' left for the Vosges Hills, France. The idea was to combine a scouting trip for our July adventure with a jeep on a trailer transport trial. And to meet up with veterans of the Fighting 36th Infantry Division. It would turn out to be the most memorable weekend we had in years. Ernest and I left Amsterdam with his Jeep Cherokee. We picked up Harry in Delft and Cor in Rotterdam. Picking up Eugene the Jeep who lives in Belgium turned out not to be that easy. Somehow the lights of the trailer Cor and his Dad had arranged refused to work with Ernest's car. Since canceling the trip was not an option we struggled well into the night to get those lights going. We drove Eugene on that trailer and secured him very thoroughly. We did not want to lose that little army car on the way. With Cor and Ernest taking turns at the wheel we drove all night on the quiet highways of Belgium, Luxembourg, and finally France. Against all odds the rain which had been falling steadily on and off all night stopped as we reached the Vosges and we arrived safely at the Bruyeres towns square. We put on our uniforms and, got the jeep off the trailer and jazzed him up with musette bags and ration boxes. First we drove to what was going to be our camp site in July and did a little inspection. It was arranged earlier by Ernest and B.J. with the help of a local 36th Division enthusiast Mr. Freddy Feve. 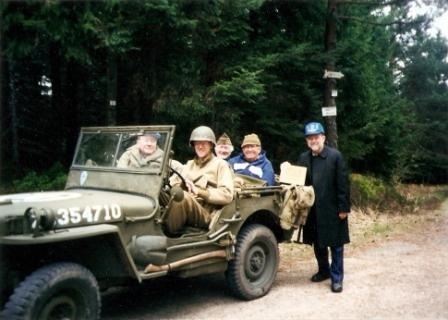 This time we were to meet Freddy around seven in the evening which gave us all day to visit the hill of the 'Lost Battalion' and see if the old jeep could handle those steep tracks. We found foxholes that could have been dug by T-patchers or Nisei back in 1944. Birds were singing, we were the only visitors and the place was so serene it was hard to imagine this was the scene of bitter and dogged warfare 54 years ago. But the foxholes were still there as witnesses of the desperate struggle to survive on that hilltop. We left one of our replica K ration boxes. Perhaps as a tribute to the Lost Battalion. Unwillingly we paid another tribute a lit bit later; we got lost ourselves on the way down. With directions of a kind mailwoman we got back to Bruyeres and took it easy that afternoon. After all we had been on the road all night. At seven we went to meet Freddy. We had written to him before but he was very much surprised to find four world war 2 GI's and their jeep on his doorstep. And they were wearing the T-Patch too. In spite of our limited French we got on very well. Freddy is a great guy and we needed his help which he was happy to give. Later that evening we headed off for Epinal where the bus with the veterans on tour would arrive around 10 that evening. Now I felt a bit like four jerks in a jeep, especially while waiting in that hotel lobby, wearing a tanker jacket, leggins and steel helmet. And we had no idea what the veterans would make of us. At last they arrived and put us out of our misery. The first thing they said was, 'Hey these must be the guys we left behind.' And when we carried their bags to the rooms (we were being bribed to do this with the promise of free beers) the ice was broken. As if there had been any ice at all. Most of the guys were pretty bushed after another all too hectic tour day, and headed for the sack. That night we camped on our little camp site only to find out the next day that in the dark we picked the swamp rather than the dry ground. Still we slept well and in the morning headed for Remiremont where there would be ceremony for the vets. At the Hotel de Ville we drove right past the waiting officials and parked under the city hall steps. Normally we would be too law abiding, too timid to pull anything like that. Maybe it was a little T-Patch power and when the vets arrived they almost ignored the mayor and other dignities to greet us and have a good look at Eugene. We were also invited to the ceremony and had some Champagne and lunch at a big restaurant. Not exactly 'haute cuisine' but hey, what 'GI' would turn down a free hot meal? So we all dug in except Cor who took Morris Courington and Wayne Kirby on a little tour in the jeep. Morris had been wounded at a road block outside Remiremont so long ago and could we find the exact spot? A lot had changed in 54 years and they were unsuccessful but he enjoyed the ride. The next day was a day off from the otherwise merciless tour schedule. And no class A passes required. Four veterans took us up on our offer to take them to the hill of the Lost Battalion; Morris Courington, Wayne Kirby, Cewin Johnson and Bob Peiser and his wife Betty. We drove with the jeep up front through Biffontaine that still carries the scars of battle. 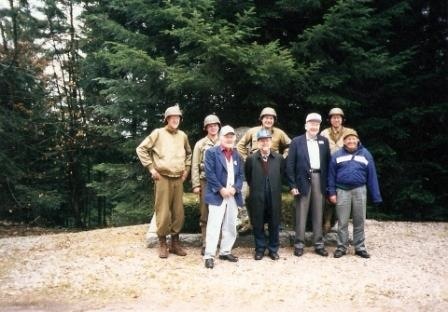 We went up hill into the forest until we came to the monument to the 442nd Nisei Regiment. It had fresh wreaths. Somebody remembered. Like ordinary tourists we started taking pictures until Wayne Kirby announced he wanted to tell what he remembered about this hill. We all stood around him as he told how he came up the hill right after the Nisei had broken through to the Lost Battalion. He was with a 81 mm mortar squad so you always had to dig in your weapon before you dug your own foxhole. He remembered his foxhole buddy: a guy named Slone, spelled S-L-O-N-E. We all just stood there and listened as he talked about the two coldest nights he spent during the war, on that hill in 1944. It was both awesome and solemn. We learned that this was the first time Wayne was able to actually tell anything about his war. They all took turns in the bus while on the way to grab the microphone and talk about what they remembered but Wayne was not able to do that until now. Even Freddy without understanding a word of English felt that this was a special moment. Then the guys wanted to see some of the old foxholes and were amazed at how many there are still to be found and how close together they were. And they found our K ration box we just had left there, took pictures and made jokes again. Wayne even posed lying in a foxhole holding an M-1 and a carbine we had brought, big grin on his face. Maybe coming up here helped heal the wounds. On the way down we met an old French farmer who had seen the boys go up the hill back in 1944. He was just as old as the vets but life is rough in the Vosges and he looked an awful lot older than the Americans. They were still whistling and whooping at the pretty girls by the road when we came down from the hill. That evening we were treated to dinner and beers in the hotel in Epinal, were shown pictures and told stories. Like what one would say when unexpectedly stumbling on a German tank, bristling with machine guns: 'Wahaababbah' and then run like hell. And how you wore your spoon in your combat boot, and how some guys preferred the attic where the garlic and onions were kept, and others liked to get into the cellars first where there would be eggs and preserves. Harry, our BAR guy talked to a vet who had carried a BAR. About both of them taking the bipod off right away; too heavy to carry. Even in reenactment. And most had kept all those things to themselves, or told them at best to those who had been there. But we, total strangers, got the stories too. They felt the folks back home wouldn't understand and we were only wearing their old uniforms but that seemed to be enough to show we were interested enough to try to understand, I guess. To me the veterans giving us the o.k. to wear the T-patch was like a seal of approval to carry on what we are doing. That evening we had to promise to come back for breakfast before setting off for home again. Freddy kindly allowed us to sleep in his house, a great improvement from our swamp. Reveille was at 0600 hours to have enough time to pack and load up Eugene the Jeep. At the hotel in Epinal it was coffee and rolls, more stories and Ray Wells gave us Fighting 36th Division Association caps, which we wore all the way back to Holland. For the first couple of hours we were all silent. How to tell the folks back home we spent all weekend with a bunch of elderly Americans but it was absolutely fantastic? In our own modest way we decided that you had to have been there to understand. These guys went through two years of non-stop hell at such an early age but there was not a trace of bitterness or disappointment in mankind you would perhaps expect. These guys bought us beers and breakfast and thanked us for being there. Heck no: thank you! Gentle Giant all. Shucks! Photo’s courtesy Robert and Betty Peiser.